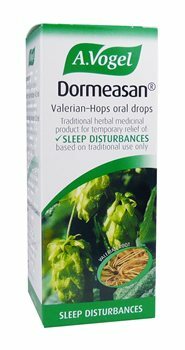 Dormeasan Valerian-Hops - a herbal sleeping aid. Valerian tincture and Hops tincture. Dormeasan is not a 'sleeping pill’'. It is a herbal sleeping aid and won't normally leave you feeling groggy in the morning. Unlike many sleep remedies, Dormeasan is available in the form of a liquid herbal tincture. Taken just half an hour before bed-time, it can help if you worry that you can't sleep - encouraging a more natural sleep, helping you sleep better and wake feeling refreshed. At A.Vogel, we insist that only freshly picked Valerian root and Hops plants are used to make Dormeasan. This ensures that the herb extracts obtained provide the active* ingredients that encourage undisturbed sleep. Valerian root tincture 0.5ml (Valeriana officinalis L.) (1:10-11) Extraction solvent: ethanol 58%v/v. Hops strobile tincture 0.5ml (Humulus lupulus L.) (1:12-13) Extraction solvent: ethanol 65% v/v. For mild anxiety: This product may also be used to relieve the symptoms of mild anxiety: Take 10 to 20 drops once or twice dailiy. Do not use if you are allergic to valerian root or hops, or if you are already taking medication for disturbed sleep or insomnia, or another herbal sleep remedy. If your symptoms worsen or if you do not feel any benefit within 4 weeks, talk to your doctor. Do not use Dormeasan if you are pregnant or breast feeding. Do not use Dormeasan if you are taking another medicine that is affected by alcohol.